One Hundred Stars has banded together with Kew Gardens to bring us this One Hundred Stars Kew Passion Flower Dressing Gown. Kew Gardens’ vibrant collection of artwork has inspired One Hundred Stars’ latest collection of stunning dressing gowns – some of our ultimate favourites to date! The One Hundred Stars + Kew RBG Passion Flower Dressing Gown is a must-have investment piece and something extra special if you’re on the hunt for a gift. 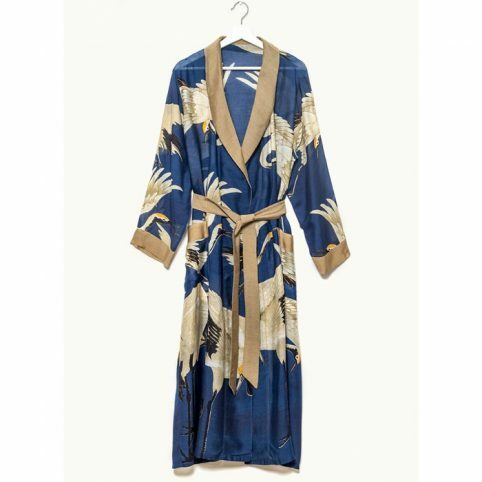 The lucky wearer will no doubt feel every inch the elegant lady of the manor with this killer dressing gown. Washing Advice: Hand wash at 30ºc and cool iron only. Do not tumble dry or machine wash. Categories: Fashion Accessories, Gifts, Gifts Over £20, NEW, Mother's Day Gifts, One Hundred Stars, Womenswear.